The City’s Department of Transportation and Engineering will present the final two design alternatives for consideration at its third public open house tomorrow night at the Woodward Theater. The study which began in 2013 as a Complete Streets initiative proposed by the OTR Brewery District Master Plan now lives on as a proposal to physically narrow the street by ten to twenty feet on the south side. The new land could potentially unlock development sites along the street. In its original configuration Liberty Street was once the dividing line between unincorporated territory and the city of Cincinnati. It was a narrow street with enough room for parking and less than two full lanes for traffic. In 1959 the City began to demolish properties along the south end of the street to widen the street to seven vehicle lanes and two parking lanes. The once quiet side street became a thru-way for automobile traffic looking to connect to the interstates and Central Parkway. 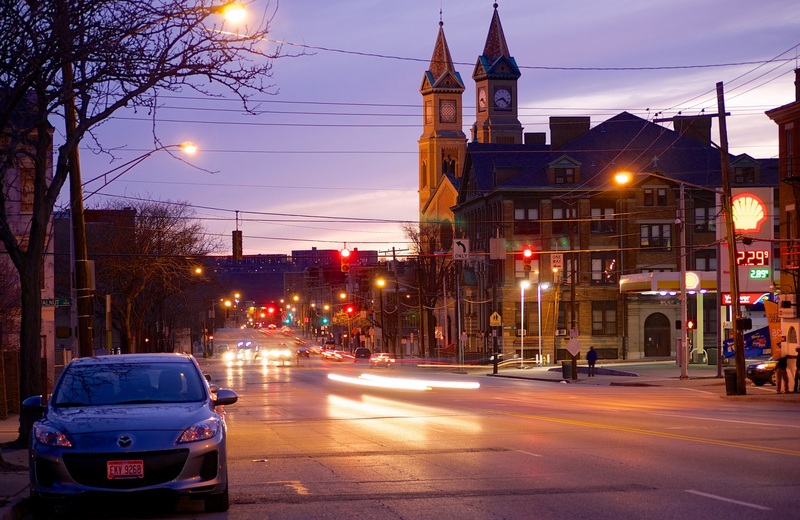 As revitalization progresses in Over-the-Rhine renewed attention is being paid to the street. The narrowing is an attempt to stitch back the fabric of the north and south halves of the neighborhood. Because of its configuration it is difficult for pedestrians to cross the street in the provided amount of time and bicycling is unsafe due to the high volume and speeds of automobile traffic. Initial configurations were many ranging from a restoration of the original street width to preserving the current set up. In between proposals called for a reduction to four or five lanes with bicycle lanes or rush hour traffic configurations. After two subsequent meetings the options are down to two: A five-lane and a six-lane configuration. Input taken from this open house will be used to narrow down to the final alternative. Once that alternative is selected it will be presented for adoption at the Over-the-Rhine Community Council in September. The meeting is this Tuesday evening, 6PM at the Woodward Theater on Main Street in Over-the-Rhine. The Theater is accessible by the #17, #19 and #24 Metro bus routes, and is within 100 feet of a Cincy Red Bike Station located at Main Street and Orchard Street. Previous articleIs Cincy RedBike America’s Most Financially Successful Bike-Share System?